LITTLE ROCK, Ark. — One child was killed and at least 45 other people were injured when a charter bus carrying a youth football team from Tennessee rolled off an interstate off-ramp and overturned before sunrise Monday in central Arkansas, authorities said. 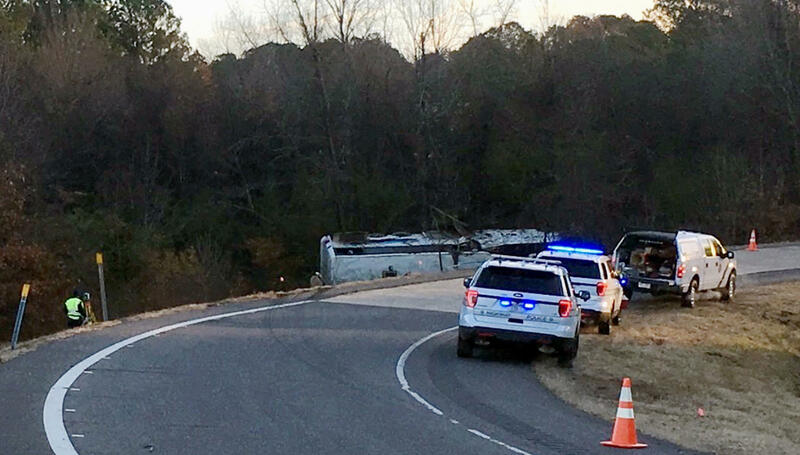 Arkansas State Police said the bus crashed along Interstate 30 near Benton, about 25 miles southwest of Little Rock, while traveling from the Dallas area to Memphis, Tennessee. Police said most of the injured were children who were taken to hospitals in Little Rock and Benton. No information was immediately released about the severity of the injuries, and authorities haven't talked about what caused the crash that happened under the cloak of darkness. Live video from the scene shows the heavily damaged bus on its side in an embankment near some dense woodland, just at the crook of a sharp bend in the road. The football team was from the Orange Mound Youth Association in Tennessee and had played in a tournament in Dallas over the weekend, according to WMC-TV. The station reports the children are elementary-school age. Phone calls and emails from The Associated Press to sports teams and coached believed affiliated with the organization weren't immediately returned Monday morning. Memphis Mayor Jim Strickland offered his condolences to the children and families involved in the crash. Memphis is roughly 130 miles east of Little Rock.